The Anderson family founded Coltsfoot, Inc. back 1984. The product was pretty simple: 100% all natural herbs, cut and mixed to resemble a tobacco chew, to help people who were trying to stop using tobacco. The very first flavor was cinnamon in the original ‘gold’ label. Next came the addition of wintergreen, and a new label design. 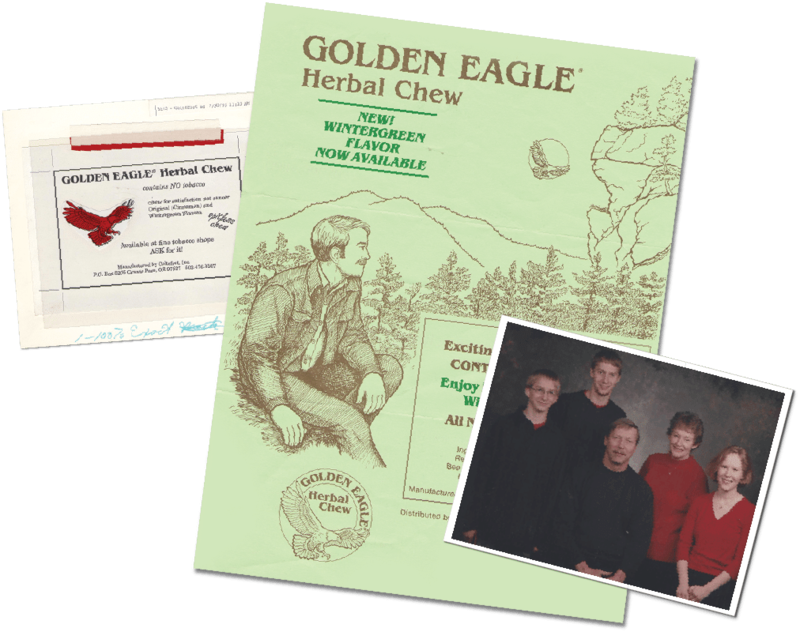 For most of the early years Golden Eagle Herbal Chew was sold through distributors to health food stores throughout the USA and Canada. It was a bit of an odd fit: selling a tobacco alternative in a health food store, as tobacco users were generally not spending a lot of time in health food stores. But word of mouth helped. 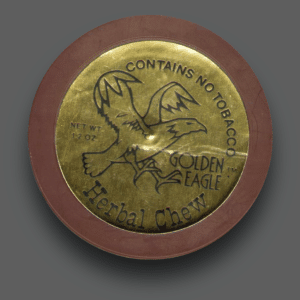 Over the years Golden Eagle Herbal Chew has helped many to quit tobacco. In later years, the label was changed to the one we know today. Flavors were expanded to include licorice-mint and hibiscus-ginger. Most recently, they added their straight flavor, to provide a more tobacco-like taste. And once a website was developed, they were able to sell to many who had not heard about them before. To this day, it is still a family run business, with Jonie and son Tom running the day to day operations. And it has stayed the same basic recipe for over 30 years, with no additives or chemicals of any kind used in making their product. WHAT ARE THE DANGERS OF CHEWING TOBACCO? Snuff contains a lot of nicotine!!! Holding and average size dip in your mouth for 30 minutes gives you as much nicotine as smoking four cigarettes. A two-cans-a-week snuff dipper gets as much nicotine as a 1 1/2 pack-a-day smoker. We are not a chewing tobacco. We are a safe alternative. 100% nicotine-free. 100% tobacco-free. 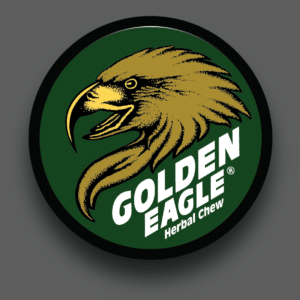 WHAT'S IN GOLDEN EAGLE HERBAL CHEW? 100% All Natural Herbs And Kosher Vegetable Glycerin. 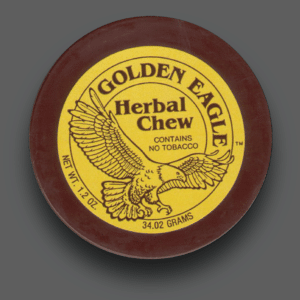 CAN PEOPLE WITH DIABETES USE GOLDEN EAGLE CHEW? Yes. The ingredient, glycerin, is commonly used in foods (including foods recommended for use by diabetics) as a sweetener, a preservative, and to prevent drying. Not all the herbs in Golden Eagle Herbal Chew are certified organic, so we cannot claim, according to government regulations, to be an organic product. However, one of our top ingredients, red clover, is certified organic and we purchase it from our home state of Oregon. CAN I SWALLOW GOLDEN EAGLE? Because Golden Eagle is 100% all natural herbs, it is generally safe to swallow. However, most of our customers tell us that they spit as that is their habit. Coltsfoot’s herbal chew is composed of food and herbal ingredients that are generally safe when used as directed. However, idiosyncratic or allergic reactions may occur when using any product. If reactions occur, we recommend that you discontinue use of this product. Not intended for use by pregnant women. IS GOLDEN EAGLE GLUTEN FREE? 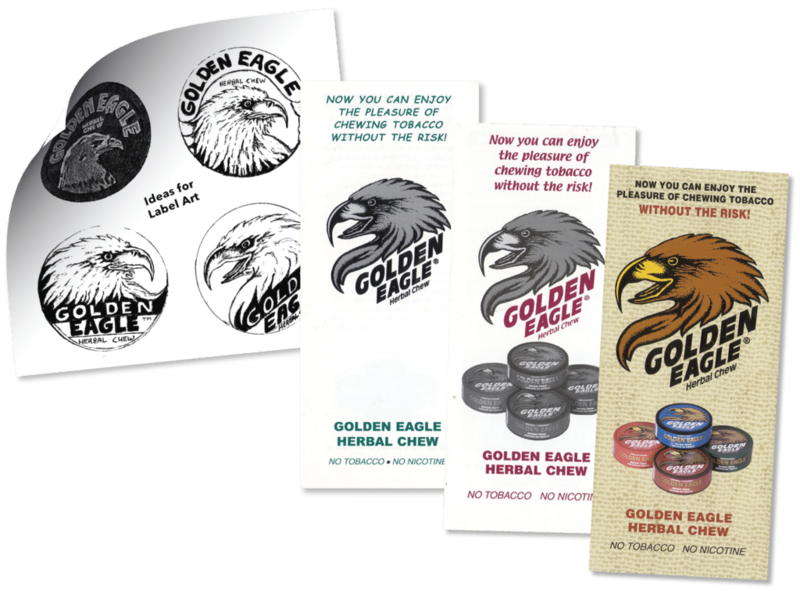 Yes, no fillers are used in Golden Eagle Chew, only 100% natural herbs and kosher vegetable glycerin. 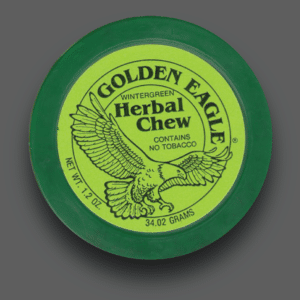 WHERE CAN I BUY GOLDEN EAGLE HERBAL CHEW? Available at Fine Health & Herb Stores, Tobacco Shops, and Convenience Stores. ASK FOR IT! Tell your local store you want them to carry Golden Eagle Chew. They can order directly from us or through one of our distributors. You can also order through our website.